Director's cut: To Higgs, or not to Higgs? To Higgs, or not to Higgs? Now, the question is: Is this the Higgs boson? Maybe. It's certainly Higgs-like. That is, it is a boson (a particle with an integral angular momentum, like a photon or Helium atom). We know this because it decays into two photons (particles of light). It can decay (that we know of) into two photons, or two heavy versions of the photons called Z bosons. In fact, the idea of the Higgs boson is that it gives the mass to these Z bosons, but not to the photons. This is called "spontaneous symmetry breaking" because the Z bosons and the photons are, a priori, equivalent, but subsequent to interacting with the Higgs boson, the Z bosons acquire a mass. They do this by interacting with the Higgs field, which pervades through space and time like molasses, and the other particles acquire a mass through a sort-of "frictional drag" (loosely speaking). Some particles (like the photon) do not interact with this, while others (like the Z boson) do. What this is: The wireframe cylinder is a representation of the CMS detector. Two protons enter the detector, each from opposite sides of the cylinder. At the center (near the "fireworks" at the middle), they collide and, through the energy-mass equivalence (E=mc^2), create a particle that decays instantly into a bunch of other stuff. In this case, the extra stuff is two photons (particles of light) shown by the two square green objects sticking out at around 1:00 and 4:00 in this view. Since the protons are composite objects made up of several quarks and gluons, there is a bunch of leftover junk that forms the rest of the"firework" explosion. What we do at CMS: We measure all of the observed stuff in the detector (i.e. the two photons, and the rest of the junk that is in the event). We reconstruct the original particle by combining all of this information, and can measure its mass (no, no divine intervention necessary!). Why this is hard: The new particle is created in approximately 1 in 10^13 events. That's a lot of events. I've described this in detail in my previous post on the Higgs. 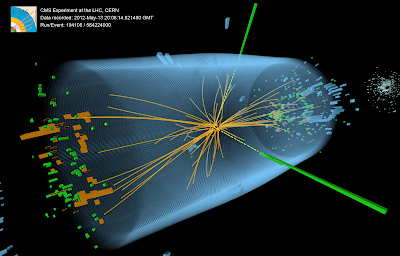 Is this the end of LHC physics? Heck no! It's only the beginning! There is a great deal of work that needs to be done here, in order to understand what we're seeing. above " "Heck It is only the beginning! " Glad to be of service and I'll do my best to explain any further information we are able to glean.